We have published a post about jQuery Mobile Project a couple of months ago. 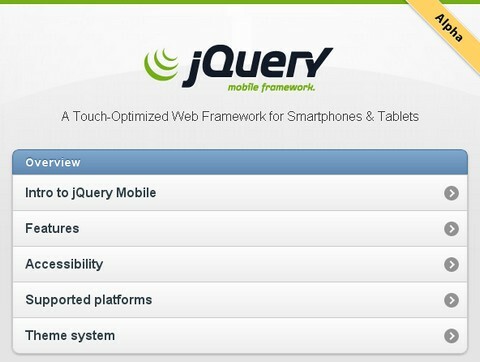 Today, they have pleased to announce the first alpha release of the jQuery Mobile. jQuery Mobile is a user interface framework, built on top of jQuery, designed to simplify the process of building applications that target mobile devices. There are two guiding principles of the jQuery Mobile project that differentiates it from most other offerings: It’s completely built on the principle of progressive enhancement and is designed to be functional in all HTML-capable mobile browsers. There are demos and documentation for all the components in jQuery Mobile 1.0a1: Theming and Layout, Headers/Footers (Fixed and Persistent), Form Controls, Dialogs, List Views, Events, Transitions. What a shame I just descovered your website. Looks great, with nice articles. Keep it up!